Two values are better and diviner than everything which is part of the human personality: truth and justice. The school has the task of exploring and developing both. 1371 A first “rector scholarum“ (principal) in the building between the chapel and the road to church is mentioned. 1564-1565 Moving of the Latin School in a new building (instead of the adjacent building) in the street Jüdenstraße; three floors with four classrooms and a teacher’s apartment. 1827 Rebuilding and enlargement into the current appearance of the building; title “Königliches Gymnasium"
1887/1888 Fomer students collect money in the foundation “Aulafenster”, which is used to pay a new window in the hall. 15.02.1897 (the evening before Philipp Melanchthon's 410th birthday) The title “Melanchthon-Gymnasium” is conferred. 1945-1990 After the war the school was also an institution preparing students for university. Many citizens have passed their final exams and proved themselves in different fields of work until today: school, economy, research, politics, health, administration . 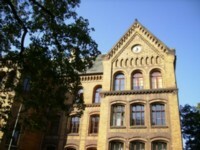 . .
Today, the third generation goes to this school and is proud of the Melanchthon-Gymnasium. 2006 Luther-Gymnasium and Melanchthon-Gymnasium go together to the Luther-Melanchthon-Gymnasium.